Jeremy Lamb leads Charlotte past Cleveland on Tuesday night. Check out the top ten plays from this Thursday in the NBA. Ben Simmons 28 points leads Philadelphia past Charlotte on Tuesday night. Goran Dragic scores 19 points, Dwyane Wade adds 17 as Miami rolls over Charlotte. Marvin Williams notches 30 points and grabs seven rebounds as Charlotte edges Washington. Kemba Walker scored 25 points for the Hornets as they got the 123-112 win over the Nets. James Harden scores 30 points, Clint Capela adds 23 points and 17 rebounds as Houston beats Charlotte. Nikola Vucevic posts 17 points and grabs 11 rebounds as Orlando blows past Charlotte. HOW ACQUIRED/DRAFT BACKGROUND: Acquired by Portland from the Houston Rockets in exchange for the draft rights to Darrell Arthur and Joey Dorsey on June 26, 2008. Originally selected by the Rockets in the first round (25th pick overall) of the 2008 NBA Draft. 2012-13: Posted career highs with averages of 14.3 points, 5.6 rebounds, 4.9 assists, 1.25 steals, 1.14 blocks and 38.5 minutes in 73 games (all starts) … Made a career-best 169 3-pointers, tied for 13th in the NBA … Led the team in total steals with 91, and ranked tied for 25th in the league in blocks … Also led the squad in free throw percentage (84.8%), and tied for 18th in the NBA … Joined Kevin Durant and LeBron James as the only players in the NBA to rank in the top 40 in both steals and blocks per game … Became fourth NBA player ever with 100 3-pointers, 350 assists and 80 blocks in a season (L. James, 2; K. Durant, S. Pippen, 1) … Finished with a career-high 35 points (13-19 FG), along with tying his career high of five blocks, Nov. 16 vs. Houston … Became the first Trail Blazer ever to record at least 10 assists, five steals and five blocks in a game Dec. 16 vs. New Orleans, and the third NBA player ever to finish with 11 points, five rebounds, 10 assists, five steals and five blocks in a game (Julius Erving, 1979; Jamaal Tinsley, 2001) … Recorded the first two triple-doubles of his career within a week, finishing with 12 points, 10 rebounds and 11 assists vs. Washington on Jan. 21, and 20 points, 10 rebounds and a career-best 12 assists against the L.A. Clippers on Jan. 26 … Notched a career-best six steals against Houston on Nov. 3 … Made a career-high nine free throws Jan. 10 vs. Miami … He and Sacramento’s DeMarcus Cousins were the only NBA players to have season highs of at least 35 points, 10 rebounds, 10 assists, five steals and five blocks … Led the team in scoring 15 times, rebounds seven times and in assists on 24 occasions. CAREER: In 328 career games (275 starts), averaged 11.1 points (44.9% FG, 37.2% 3-PT, 84.0% FT), 4.3 rebounds, 2.1 assists and 28.9 minutes … Increased his scoring and rebounding averages in each of his five seasons … Ranks third in career 3-pointers by a Trail Blazer (506) and seventh in free throw shooting at 84.0 percent (min. 500 free throws made) … 2011-12: Averaged then career highs in points (13.9), rebounds (4.6) and steals (0.97), and led the team in blocks (1.02) in 59 games (34 starts) … Broke a franchise record with nine made 3-point field goals Feb. 4 vs. Denver, shooting 9-of-15 from 3-point land on his way to a then career-high 33-point outing … Notched the second 20-point, 10-rebound game of his career on April 4 against New Jersey, posting 20 points and 10 rebounds … Recorded back-to-back double-doubles for the first time in his career April 2 vs. Utah (16 points, 10 rebounds) and April 4 vs. New Jersey (20 points, 10 rebounds) … Tied his then career-high 33 points Feb. 14 vs. Washington … Reached double-figure scoring in 40 of his 59 games, including seven 20-point outings and two 30-point outings … Placed 30th in the NBA in 3-point field goal percentage (39.1%), 30th in free throw percentage (83.6%) and 33rd in blocks per game (1.02) … 2010-11: Counted then career bests in points (12.4), rebounds (4.5), assists (1.5), steals (0.85) and minutes (31.5) while appearing in 80 games (67 starts) ... His buzzer-beating tip-in gave Portland a 98-96 win over San Antonio on March 25 … Rang in a season-best 25 points (10-16 FG) on March 20 at L.A. Lakers ... Registered 13 points and a career-high 14 rebounds on Dec. 5 vs. L.A. Clippers ... Scored at least 16 points in six straight games from Nov. 4 to Nov. 13 ... 2009-10: Finished regular season with averages of 10.1 points, 3.8 rebounds, 1.2 assists and 24.8 minutes in 37 games (25 starts) … Shot 51.9 percent (139-268) from the field and 40.9 percent (54-132) from three-point range … Counted a season-best 12 rebounds to go with 12 points for his first career double-double April 14 vs. Golden State ... Notched season highs of 31 points (22 in third quarter), 11 field goals (of 16), five 3-pointers (tied) and seven assists (tied) Feb. 27 at Minnesota ... Made his season debut Jan. 25 vs. New Orleans ... Underwent surgery to repair a torn labrum in his right shoulder on Oct. 30, 2009 … 2008-09: In rookie NBA season with the Trail Blazers, posted averages of 5.4 points, 2.8 rebounds, 0.9 assists and 18.4 minutes in 79 games (76 starts) … Shot 44.6 percent from the floor and 36.9 percent from 3-point range … His 76 starts ranked third on the team … Placed eighth in 3-point shooting (36.9%) and 10th in blocked shots (0.51) among rookie league leaders … Scored a season-best 20 points (7-8 FG, 2-2 3-PT, 4-4 FT) March 13 vs. New Jersey. PLAYOFFS: Appeared in all 18 of Portland’s postseason contests (11 starts) since 2009, notching averages of 6.1 points and 1.8 rebounds in 19.6 minutes … 2011: In six games vs. Dallas, he averaged 8.0 points, 1.7 rebounds and 1.3 assists in 25.2 minutes … 2010: Notched 8.2 points, 3.2 rebounds and 23.2 minutes in six games (all starts) vs. Phoenix … 2009: Played in all six of Portland’s games (five starts) against Houston, averaging 2.0 points (5-9 FG) and 0.5 rebounds in 10.5 minutes. PRO CAREER IN EUROPE: IGrew up playing for MSB Le Mans in his native France and made his French Pro-A debut during the 2005-06 season … 2007-08: Averaged 12.3 points, 5.0 rebounds, 3.6 assists and 1.33 steals in 30 games with MSB Le Mans in the French Pro-A League … Recorded four games of 20-plus points, including a season-high 25 points on Aug. 12 vs. Nancy … Posted averages of 8.5 points, 3.5 rebounds and 2.7 assists in Euroleague play … 2006-07: Averaged 5.0 points and 2.9 rebounds in 16.2 minutes a contest … Averaged 4.3 points and 1.7 rebounds in 13.4 minutes per contest in Euroleague play … 2005-06: Appeared in two French Pro-A games, scoring a total of six points … Averaged 14.3 points and 6.8 rebounds for the Le Mans Espoirs (junior) team … 2004-05: Played with Le Mans Espoirs (junior) team, averaging 5.2 points and 3.1 rebounds in 18.3 minutes per game. 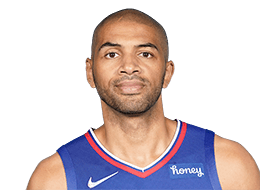 FRENCH NATIONAL TEAM: Averaged 15.5 points (second on team), 5.7 rebounds (second on team), 1.2 assists and 1.5 blocks (led team) in 27.2 minutes over six games as a leader on the French National Team that reached the quarterfinals at the 2012 Summer Olympics in London … Averaged 13.8 points (ninth in tournament), 3.2 rebounds, 1.4 assists and 2.0 steals in helping France to a second place finish in the 2011 European Championships … Averaged a team-high 12.5 points to go with 3.2 rebounds, 2.2 assists and 1.33 steals in six games as a leader on the French National Team at the 2010 World Championships … Ranked second on the team with 9.6 points and 4.9 rebounds to go with 1.8 assists, 1.00 block and 28.6 minutes in nine games in the 2009 European Championships … Helped France win the bronze medal at the 2007 U19 World Championships held in Novi Sad, Serbia, averaging 11.7 points, 5.7 rebounds and 4.3 assists … Averaged 14.3 points and 7.9 rebounds in helping France capture the gold medal at the 2006 European U-18 Championships held in Amaliada, Greece, earning Most Valuable Player Honors … Averaged 5.4 points and 4.0 rebounds with France at the 2005 European U-18 Championships held in Belgrade, Serbia … Helped lead France to the 2004 European U-16 Championships held in Greece.